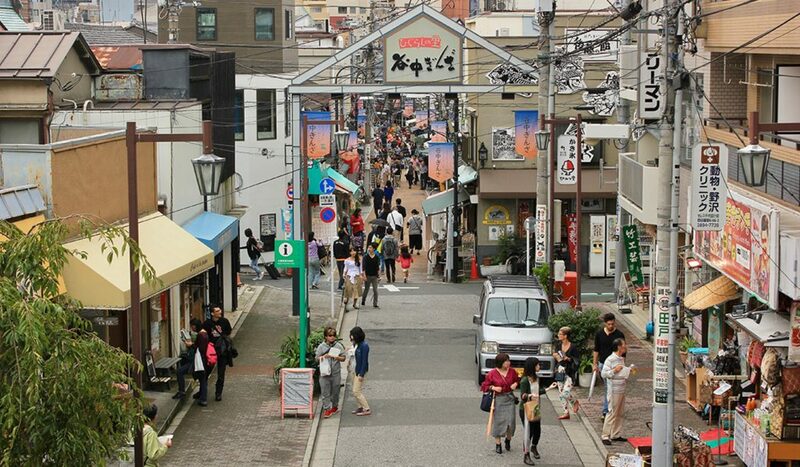 The old town of Yanesen is a charming district in the north-eastern side of Tokyo. It gets its name, Ya-Ne-Sen, from the three neighborhoods that make up the area: Yanaka, Nezu, and Sendagi. Known for its traditional buildings and temples that have stood the test of time, Yanesen Tokyo is popular with visitors who want to experience what it was like to walk the streets of Tokyo in the Edo-period. Fascinating museums, adorable shops, solemn shrines, and the local atmosphere all make Yanesen Tokyo a must-see for your visit to Japan. Yanesen Tokyo is located in Taito-ku Tokyo, near Ueno. 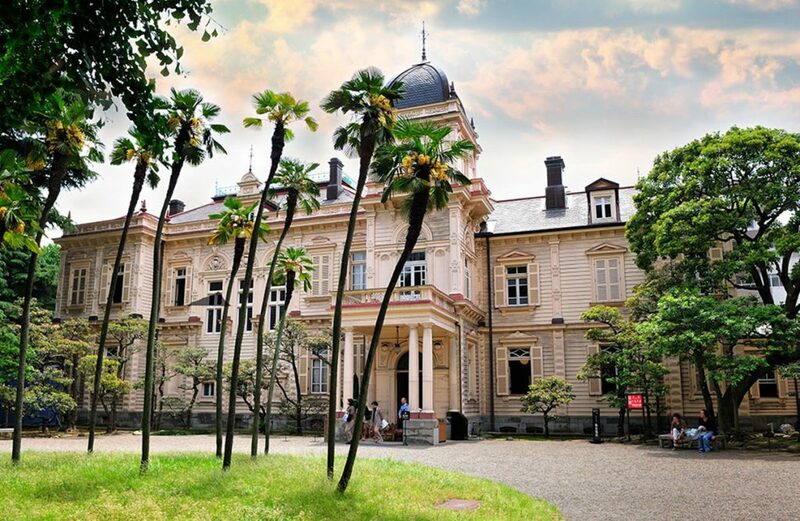 After enjoying a stroll through the famous Ueno Park, visiting the many museums in the area and spend some yens shopping in Ueno, you can easily walk to the Yanesen Tokyo district in about 15-minutes. Alternatively, you could start your journey from Nippori Station and make your way through Yanaka first. You can also access the Yanesen Tokyo area using the subway stations Sendagi Station or Nezu Station on the Chiyoda Line. Like many old towns in Japan with every narrow street packed with food stalls and cafes serving all kinds of delicious snacks and sweets, Yanesen Tokyo does not disappoint. The Yanesen Tokyo district is best enjoyed by walking, so, though many of the attractions are close together, you’ll definitely work up an appetite going from place to place. Discover what are the Traditional Japanese food you shouldn’t miss in Japan. A local favorite is the famous menchi-katsu from Niku no Suzuki. Menchi-katsu is a type of chopped meat patty that is breaded and deep fried in oil until it has turned crispy golden brown. Usually, menchi-katsu is filled with beef, pork or a mixture of the two. The shop Niku no Suzuki can be found in Yanaka Ginza. 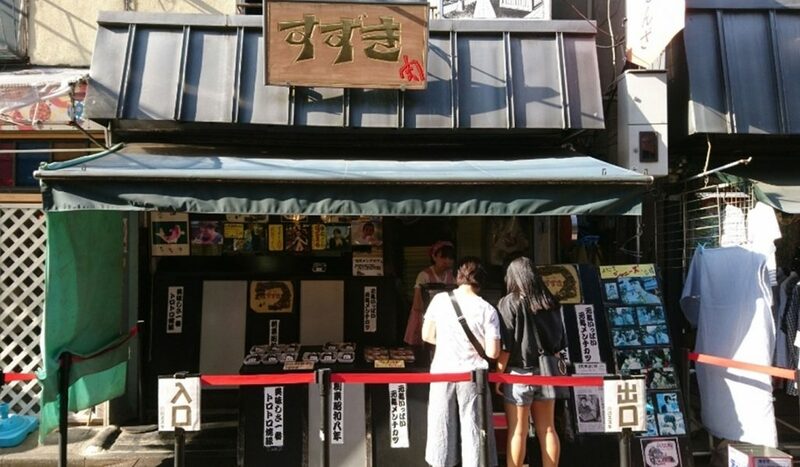 It is not uncommon for customers to line up along the street to get a taste of the delectable fried snack. The special ingredients and cooking oil used in their best-selling Genki Menchi-Katsu make it irresistible to locals. You’ll often see people munching on their menchi-katsu while enjoying a casual stroll through the quaint old town. 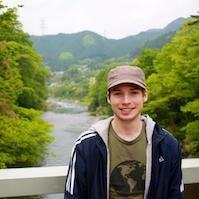 What to do in Yanesen Tokyo? When planning a relaxing vacation, stopping by a cemetery may not be high on your list of things to do. However, the massive Yanaka Cemetery can be viewed just as much as a park as a graveyard. Lined with beautiful cherry blossoms for spring and stunning deciduous trees for autumn, walking through this historic cemetery is popular among many locals and visitors. The area is oddly romantic. Over 7,000 huge stone graves create a kind of maze where couples can walk quietly without bumping into too many people. Adding to the morbid romanticism of the area’s atmosphere are the remains of a burned down 5-story pagoda that was destroyed in 1957 by two lovers with a suicide pact. 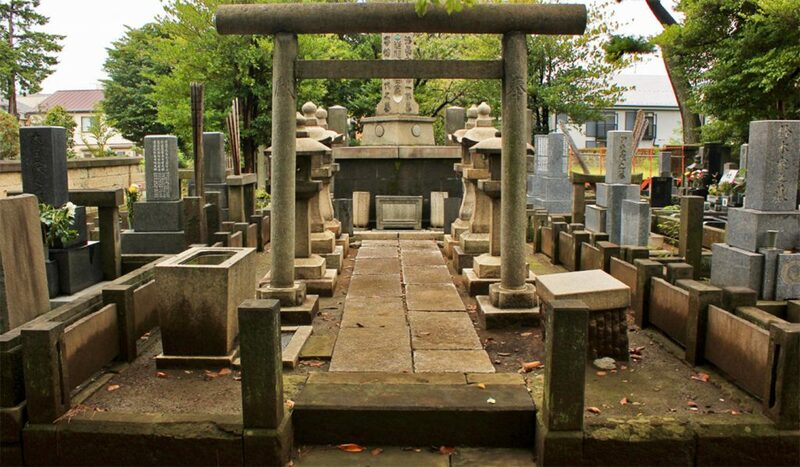 Yanaka Cemetery is also a point of interest for people who love Japanese history. Many famous historical figures were laid to rest here, including the last shogun of Japan — Tokugawa Yoshinobu. The graves of influential artists and scholars throughout Japanese history, like Ichiyo Higuchi — a novelist who appears on the Japanese 5,000 yen bill — can also be found here. 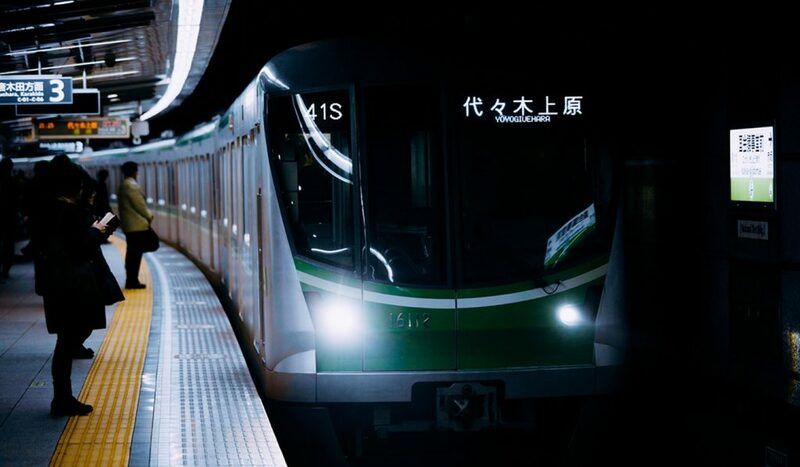 You can access Yanaka Cemetery and Tennoji Temple easily by taking the JR Yamanote Line to Nippori Station. The area is only a 3-minute walk from the south exit of the station. As it is still a cemetery, please remember to be respectful. When you first arrive in Yanaka, you will immediately notice that many of Tokyo’s stray cats have made this place their home. The area is famous among cat lovers, and Yanaka has fully embraced this image by decorating the streets with sculptures of the friendly felines and setting up shops celebrating the cute, cuddly creatures. 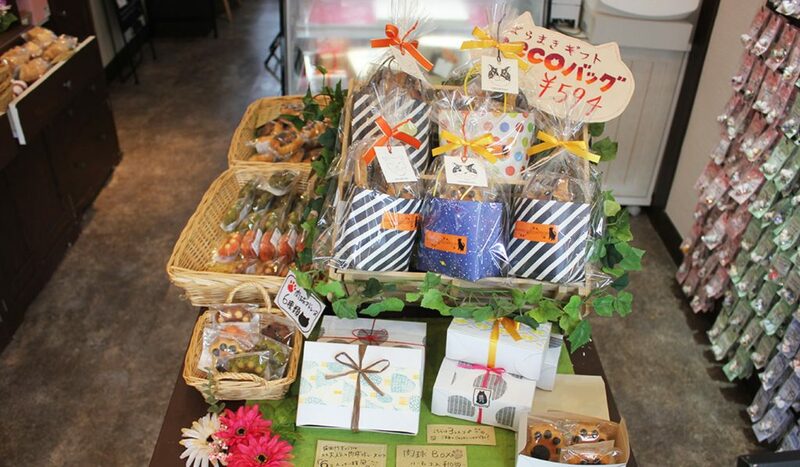 Café Nekoemon is one of the best in the area, offering a wide variety of cat-themed snacks and trinkets. Here you can even try making your own maneki-neko, or lucky cat, a common figure that you may see in many shops around Japan. 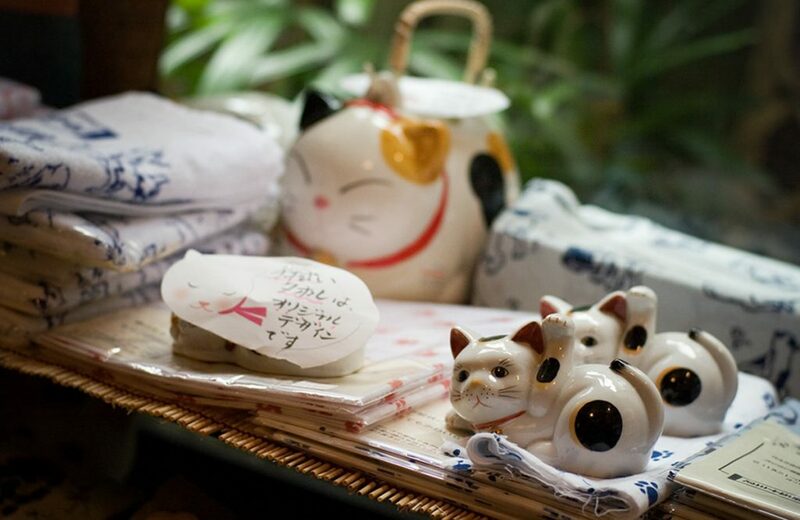 Keeping with the theme of the area, Café Nekoemon is set in a very traditional looking Japanese building and promotes a calm, relaxing atmosphere. It is a great place to rest and experience the local culture while also creating your own unique souvenir to take home. Not far from the cemetery and Café Nekoemon, you can find the Asakura Museum of Sculpture. This astonishing museum was once the home of the famous Japanese sculptor Fumio Asakura. Inside you can admire many of his sculptures throughout his career in naturalist realism sculpting. 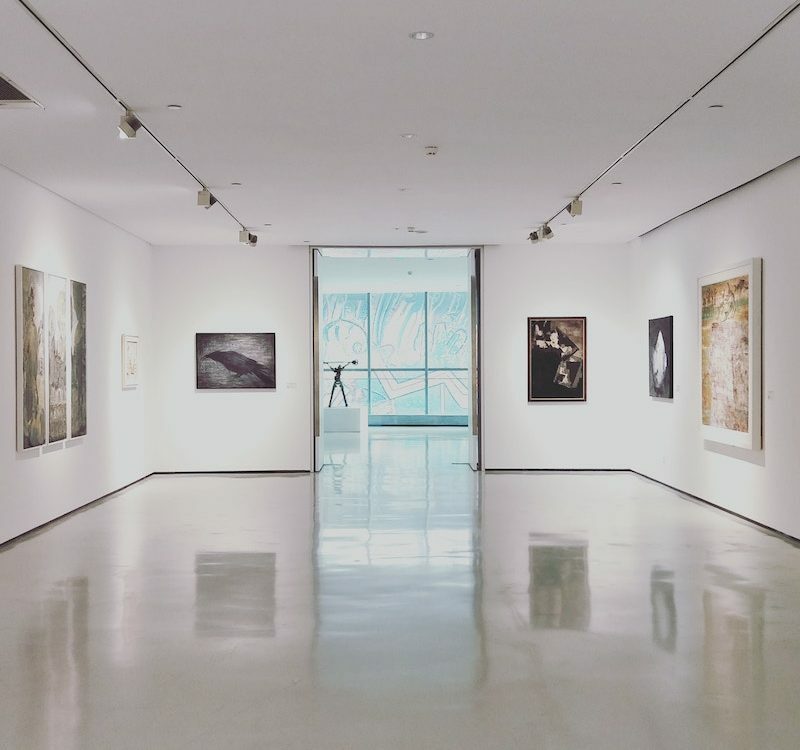 As his success grew, so did his home and studio, meaning the building itself is also a part the artist’s works, as he carefully selected the materials and designs. 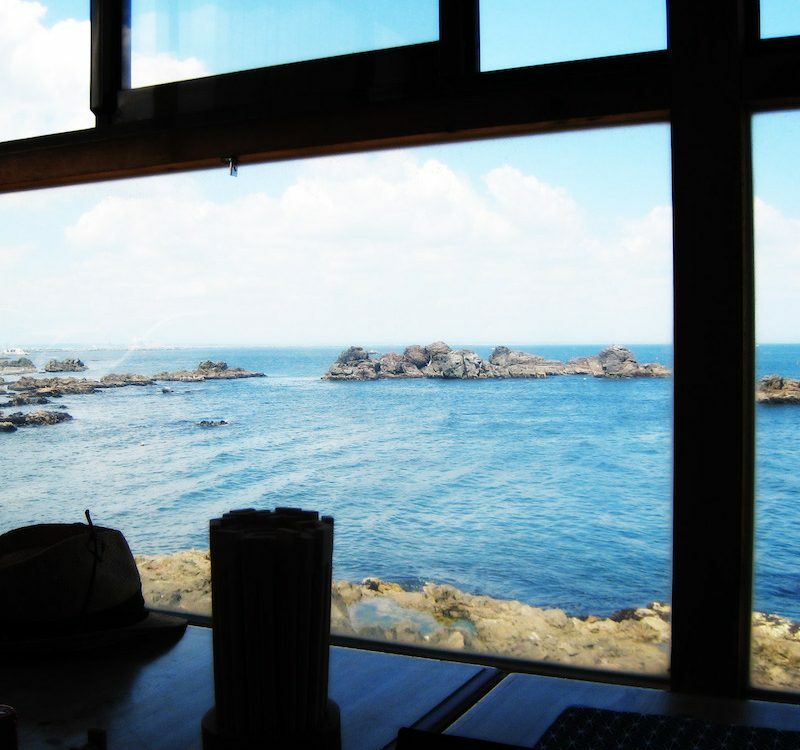 The home is divided between a Japanese-style living space and Western-style studio space, both exhibiting the lifestyle and character of Asakura. Showing his love of nature is the rooftop garden and the particularly beautiful garden pond. 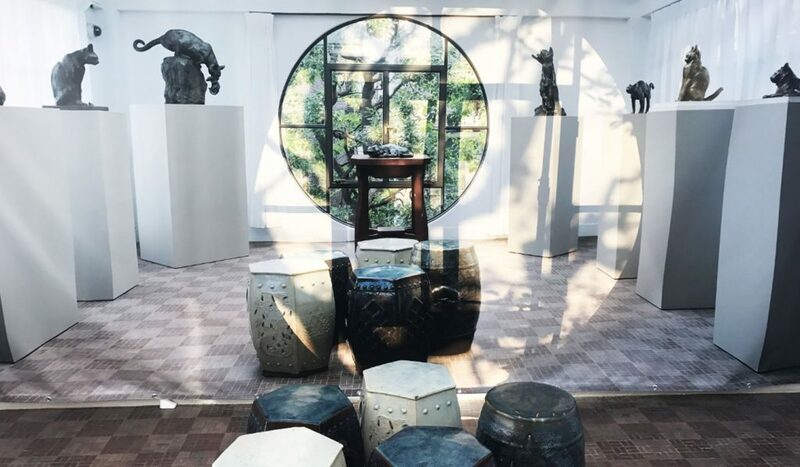 In the orchid room upstairs, you can see numerous sculptures of cats as well as a photo of him surrounded by his feline friends — very fitting for the area of Yanaka. Yanaka Ginza is the main shopping and entertainment street in Yanaka, and like any old town in Japan, even a short walk down this rustic street will make you forget that you are actually in modern Tokyo. The Yuyake Dandan just before the stairway leading into Yanaka Ginza provides a great place to see the photogenic street. At around sunset, it looks like a scene out of an old romantic Japanese film. Yanaka Ginza brings together all of the best aspects of Yanesen Tokyo — the culture, the cats, the food, and the relaxing, nostalgic atmosphere. 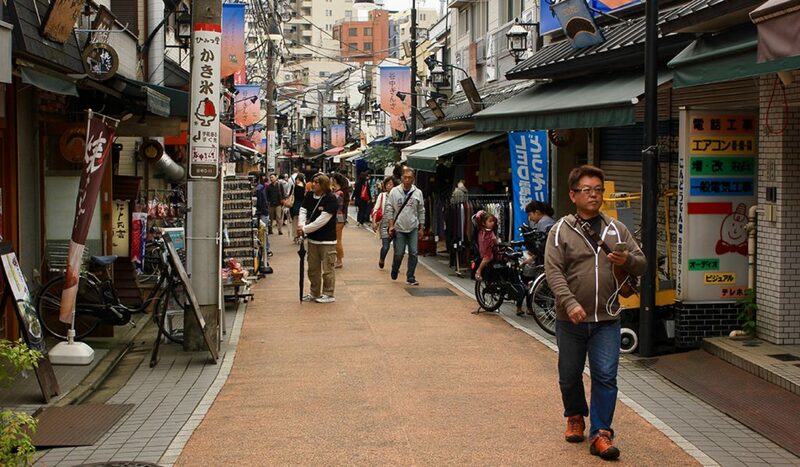 See how locals go about their daily life as if they were still living in a small Showa-era town while grabbing a bite to eat or shopping for souvenirs. Yanaka Ginza is only about a 3-minute walk from Nippori’s East Exit if you just follow the road naturally and take a right turn where it forks. You can also reach Yanaka Ginza from the Sendagi Subway Station in about 2 minutes. From Exit 2, cross the street and turn left to walk up Shinobazu-dori. Then take your first right, then your first left, and finally your second right to reach Yanaka Ginza. 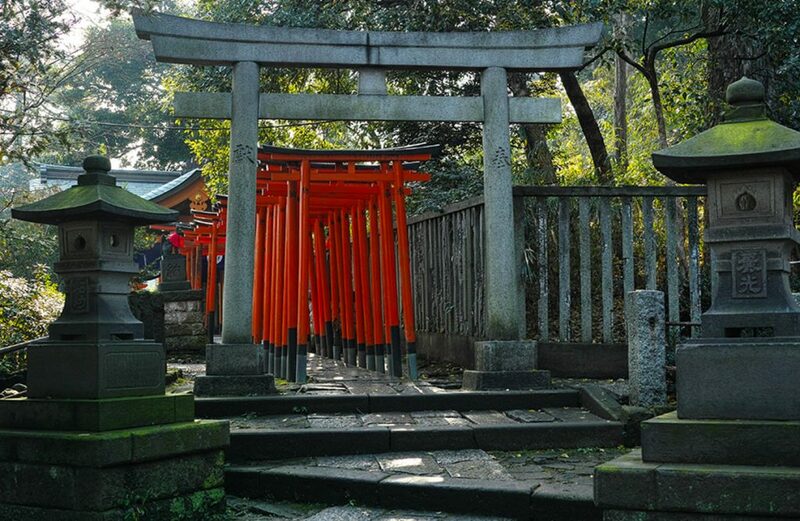 Nezu Shrine is one of Japan’s oldest shrines, with its founder, “Yamato Takeru” said to have lived in the first century A.D. It’s almost mystical tunnels of red, traditional Japanese gates called “senbon torii” may be recognizable by many people. Walking through them feels like you are being transported into a Ghibli film. 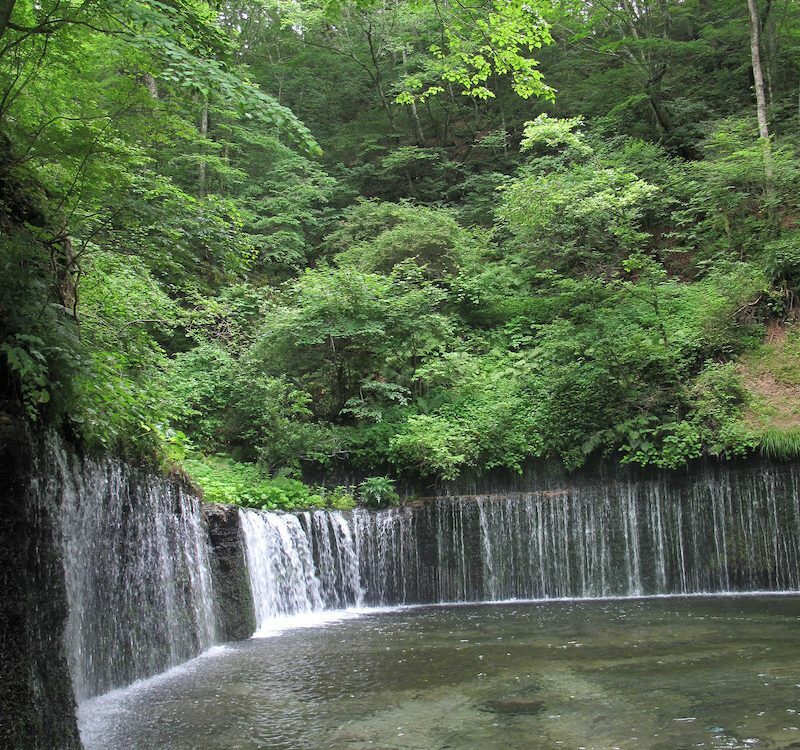 It is a popular path for tourists to take photos and appreciate ancient Japanese culture. The tunnels lead to a small observation deck where you can view more of the shrines features, like a small pond or the colorful main shrine building. Though beautiful year-round, Nezu Shrine in Yanesen Japan is very popular during spring thanks to its impressive azalea that bloom in pink and white every year. 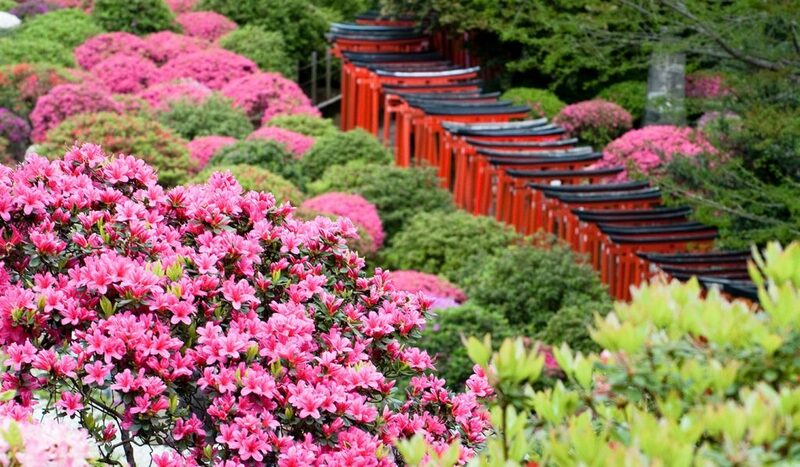 The scene is so spectacular that people from all over the country come to see and participate in the annual Nezu Shrine Bunkyo Azalea Festival where the season is celebrated with food, drinks, crafts, dancing, and music. 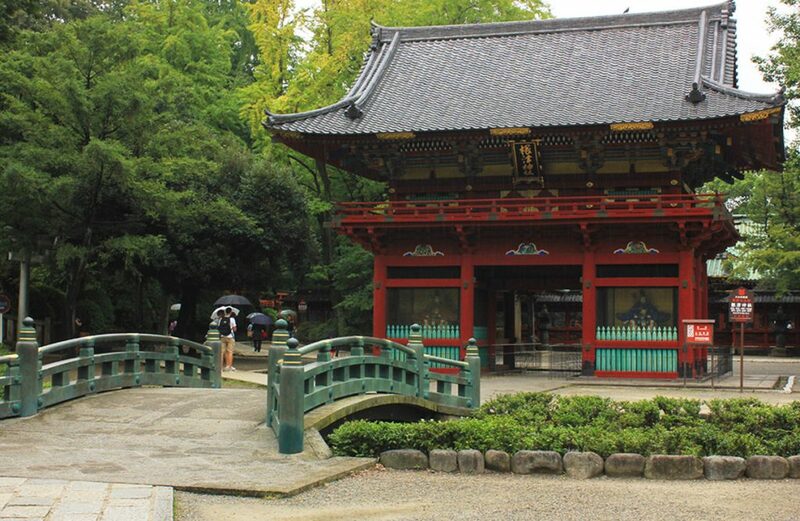 Nezu Shrine is about a 5-minute walk from Nezu Station on the Chiyoda Subway Line. Take a left from Exit 1, then turn left again at the second stoplight. 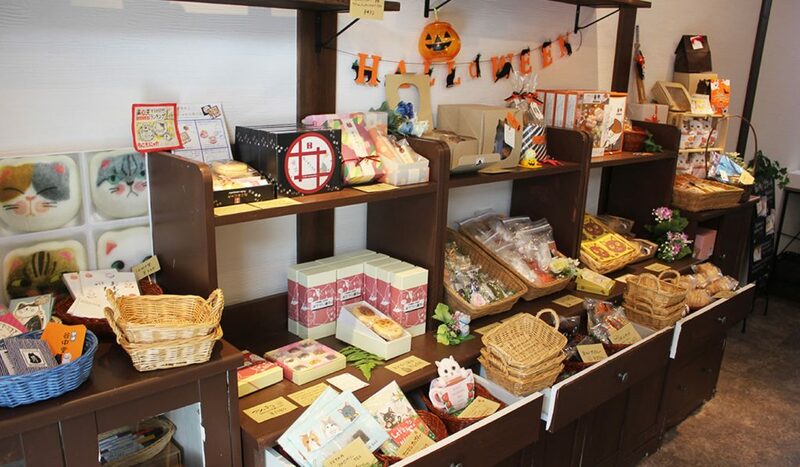 No other place makes snacks and candy quite like Japan. Amezaiku, or “craft candy”, has been around for hundreds of years and is a major part of Japanese culture. 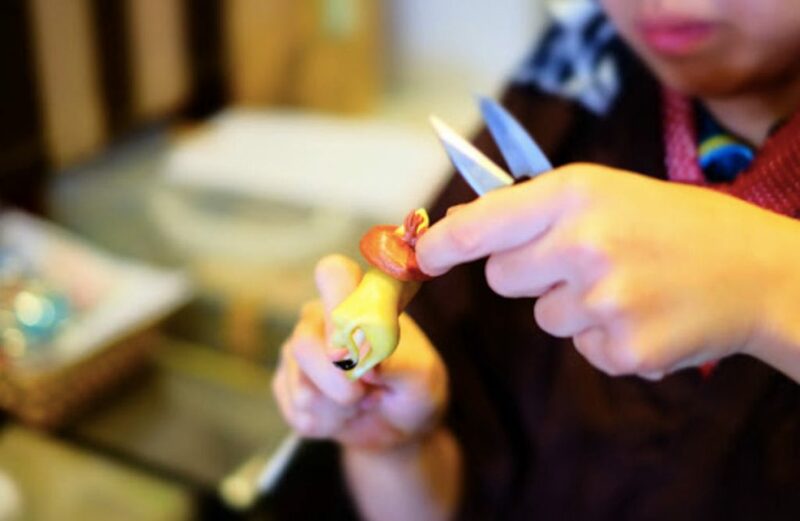 The tradition started to take off in the early Edo-period, and now you can find shops selling sweets that are almost too cute to eat anywhere you go in Japan. 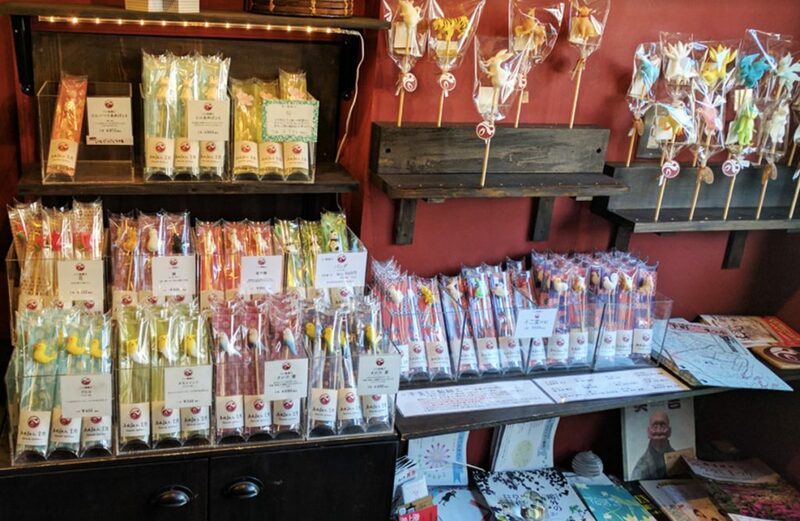 Amezaiku Yoshihara in Yanesen Japan is the ultimate craft candy shop. The craftsmanship involved in the sweets elevates the delicious candy to edible works of art. This traditional Japanese confectionery really is a treat for the eyes and mouth. You can choose from many designs to enjoy for yourself or to give as gifts to your friends. Amezaiku may seem childish, as it is just candy shaped like cute animals. However, it is actually very difficult to make. You can learn more about the shaping of amezaiku by watching a live performance of the artists creating your candy right in front of you. Performances end at 5 pm. Kyu-Iwasaki-tei Garden is a vast estate that once belonged to the powerful Iwasaki family who founded Mitsubishi. The main Western-style house and billiards house were designed by British architect Josiah Conder, making them a striking contrast to the area’s many old-fashioned Japanese buildings. At the time it was constructed in 1896, it was the first place to have Japanese and Western-style houses built next to each other. While the Western-style house is more apparently extravagant, both residences are equally beautiful in their own way. Each also has a spectacular view of the spacious garden lined with well-groomed trees. 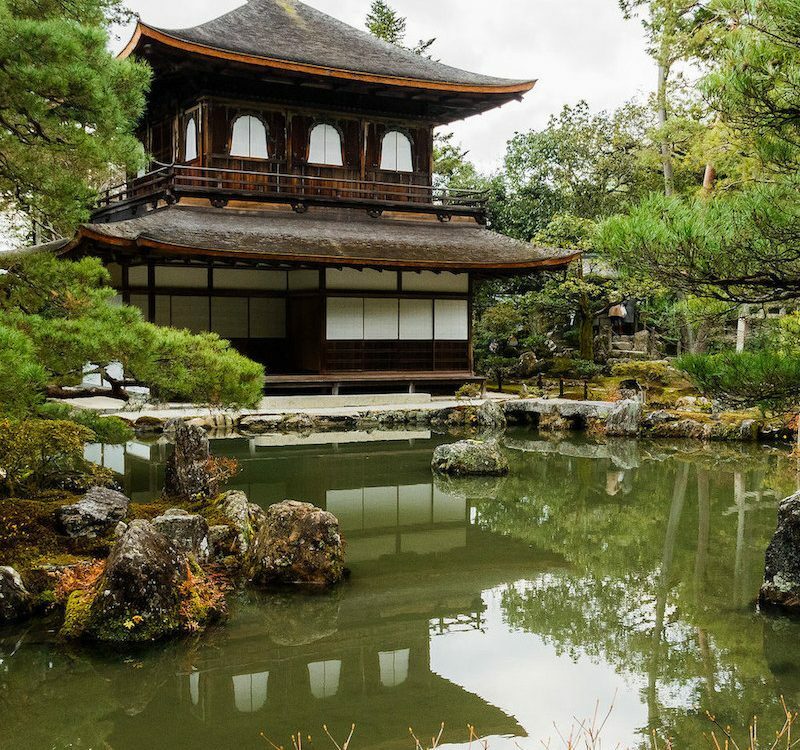 Further, into the property you can find wonderful Japanese garden features like a pagoda, stone lanterns and a rock garden. The main attraction is the guest house with its beautiful stained glass and enchanting interior. Inside you can appreciate the architecture while calmly enjoying some matcha tea. An entire afternoon could be spent walking around the grassy gardens and admiring the elegant structures. It is a must-see for anyone interested in history or architecture. 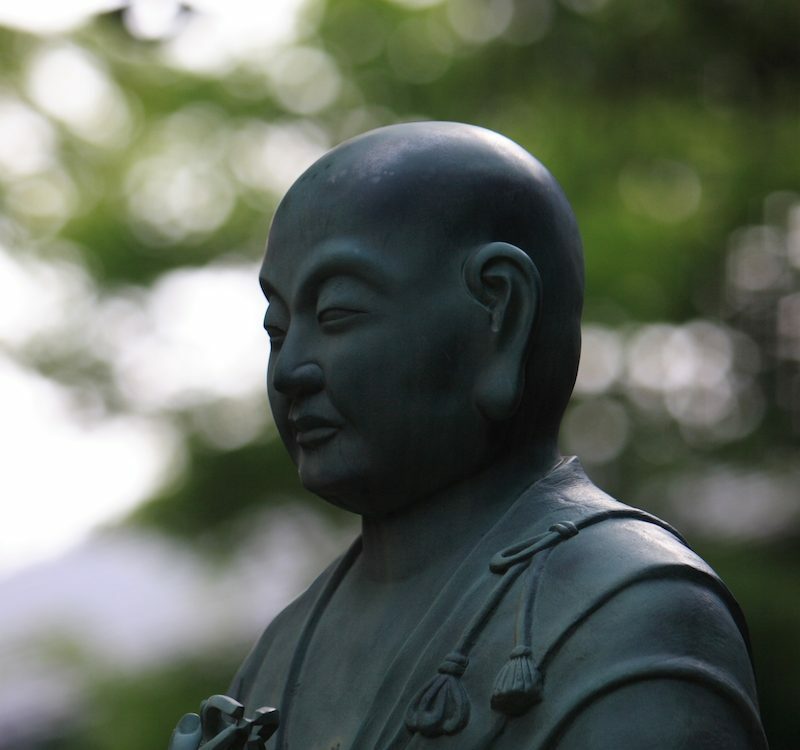 In Japanese Shinto mythology, Tenjin is the name of the god of scholarship and learning — a deity created to honor the most famous Japanese scholar and poet of the Heian period. Many students come to Yushima Tenjin Shrine to pray for good grades and to pass entrance exams. Throughout the shrine, you can see a number of wooden plaques or paper notes pleading for academic success and knowledge. 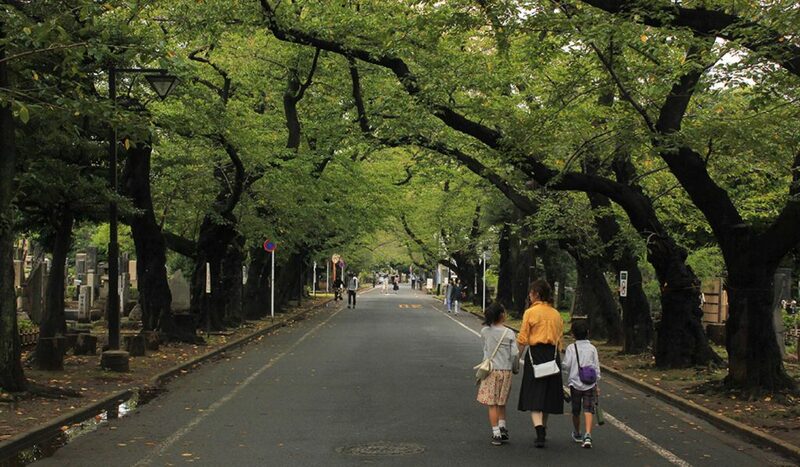 Like many shrines, Yushima Tenjin is filled with beautiful nature. It is a pleasant area to enjoy a peaceful walk, even if you aren’t in desperate need to pass a test. 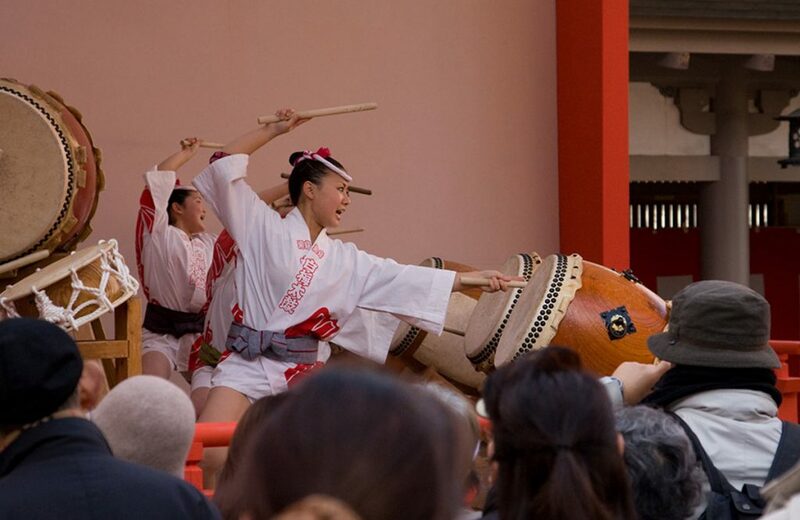 In the spring, over 300 trees bloom bringing more life to the shrine, and on May 25th the grounds are packed with music and dancing during the Yushima Tenjin Festival. Along with the incredible traditional Japanese architecture found at most shrines, at Yushima Tenjin Shrine, there is also a large bronze statue of a cow, the animal believed to be the servant of Tenjin. It is said that touching the cow will cure physical illness. 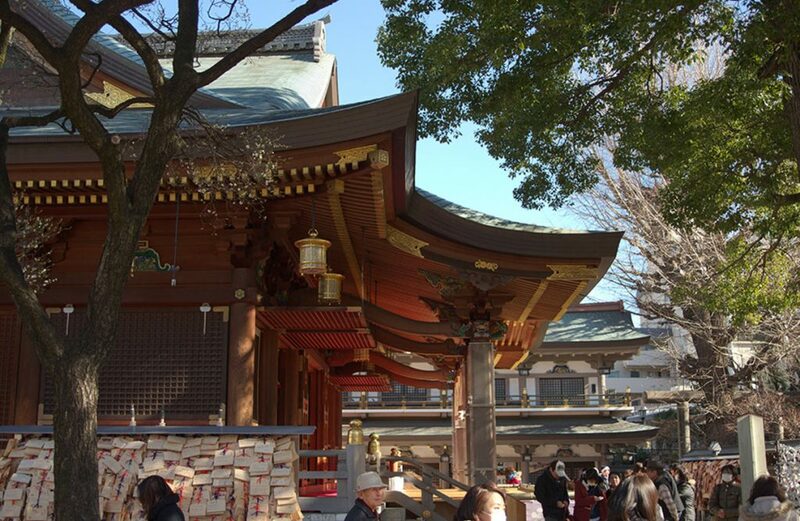 Yushima Tenjin Shrine is a short 2-minute walk from Exit 3 of the Yushima Subway Station. While many people often visit the well-known Shibuya crossing or other popular Tokyo landmarks, Yanesen Tokyo is a hidden gem that should not be overlooked. It is rare to find such well-preserved culture in massive modern cities, and that is what makes Yanesen Tokyo so special. 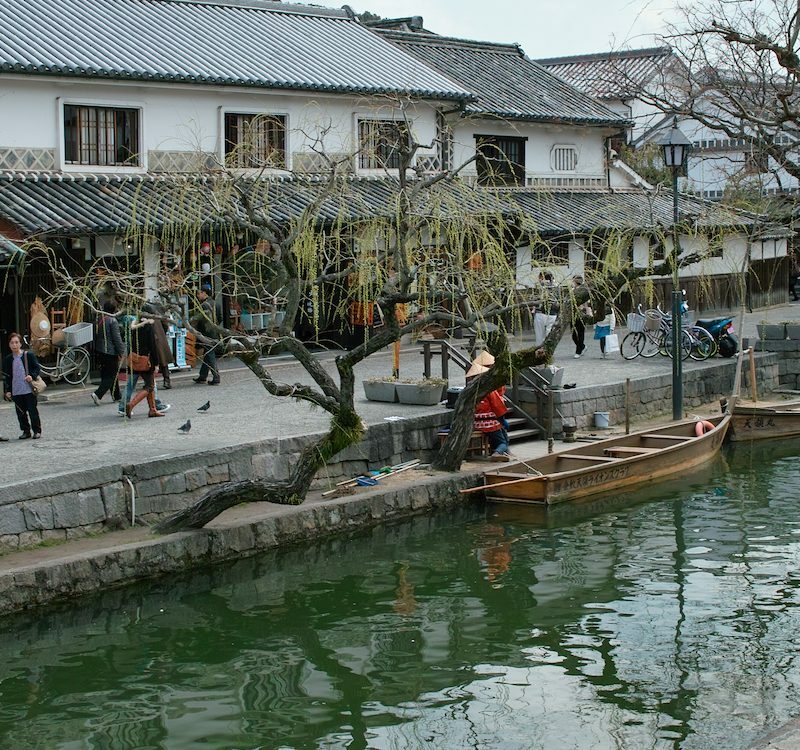 Don’t miss your chance to experience the real Japan in this old-fashioned town. There is a lot here to surprise you. If you want to discover more places to visit in Tokyo, check out our selection of the Top 23 Best Things to do in Tokyo. 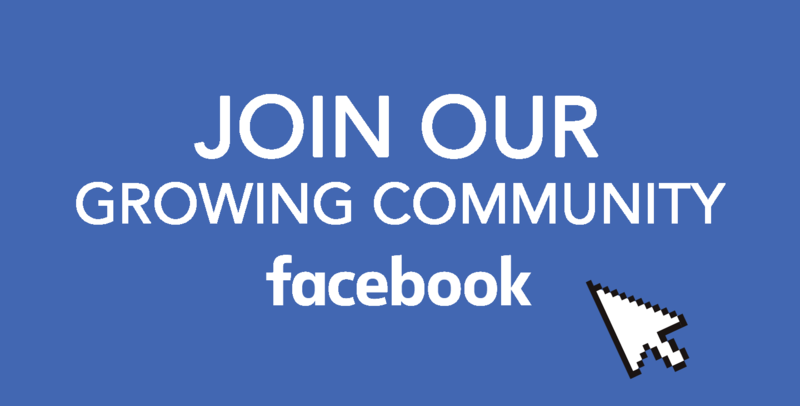 We are a growing community of Japan enthusiasts on Facebook, join our Facebook group and be a part of it! Last but not least, follow us Facebook, Instagram, and Pinterest.